I have a set Cornwall 1. I listen to these speaker at conversation level, or slightly higher 90 plus % of the time. what like is that they have great detail at low levels, very room filling sound, and still sound great off axis/in another room. I am soon to move. New room 12x24, with 8 ft ceilings. The speakers will be on 12x16 portion because of hallway opening breaking the wall up. 1 speaker will be close to corner, and other, only back wall. I have been kicking around the idea of selling my Cornwalls for either NEW Cornwall/ La scala/ Fortes, or used chorus ll. I have a pair of quartets, so I get an idea of the flavor of the rear passive speakers, however I have to crank them louder than I usually like, to get them to open up, but at louder levels I might enjoy them better than the Corwalls at the same level. I am wondering if the quartets (New) bigger siblings can play as well or better at lower levels as my Cornwalls, or would they be similar to quartets? Would the La Scalas need more room to breath even at my normal listening levels? I wonder if it would be worth the change since I listen mostly low to medium low levels with the occasional crank fest? Should I just upgrade the stock Cornwall's? If I do upgrade, who do you think would have the upgrades that would best fit my style of listening. I listen to all music except the screaming metal. I don't know the name of the genre. If it were me I would do nothing, for now, try them in your new room first. I would think they will be even better in the new room but there is only one way to know, wait. Now as far as "upgrades", myself i would just update the crossovers if they are original, new capacitors, if not done already. I would keep them stock to know how they are designed to sound, see what you think and go from there. I have a theory that speakers used very frequently don't new crossover updates and the ones stored for long periods will need new caps. The only speaker I've had that obviously needed new caps was a 40 year old H700 (and a pair of La Scalas almost that old). It sounded "polite", "reserved", and even "muffled". 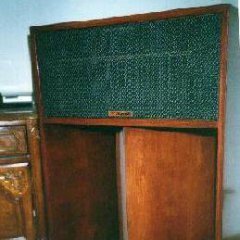 You will be so accustomed to the sound of your Cornwalls you won't notice most of that, but if you sit and listen and the music doesn't sound like it is out in the room with you, you may need new capacitors. You should install good film and foil caps. They will not be cheap. You might also try wrapping the horns with rope caulk or Dynamat to calm vibrations in the horn itself. It made no detectable difference in the K-77s I treated, but was audible in my K-400s and perhaps in my K-700s. Other than that, they obviously need lots of loving ear time. 😀. Your new room, with dimensions that are 1:1.5:3 will be problematic. You may have to put a speaker on adjacent walls or other unusual locations to reduce room resonances. dtel- I agree with you, but let me tell you, that I have made about 5 moves with two set of Cornwall's, Quartets, and an assortment of other speakers in tow. That's a lot of lifting. Don't get me wrong though, I am not complaining, my back is. It whispers to me at night to sell them all, and have a new set delivered to my new pad. I still don't know who will win the argument. If I decide to go new, is there any particular reason out of (Cornwall lll, Forte lll, of La scala ll) that one would stand out with my room dimensions, or my listening habits? what about heresy lll with subs? would they still sound clear and dynamic at low listening levels? If I decide to go new, is there any particular reason out of (Cornwall lll, Forte lll, of La scala ll) that one would stand out with my room dimensions, or my listening habits? That's a tough one, all three have a considerable different sound. We have the Cornwall lll and the Forte lll but not the Lascala and all 3 are quite different. The LaScala will have less bass..especially at lower volumes but the midrange will be much bigger. especially less bass than the Cornwall. The Cornwall will have a larger sounding bass section then the Forte but not as tight as the Forte lll, or a overall more balanced sound as far as bass to mids and highs that the Forte has. To me this is very hard to describe, all three are great, just some more pronounced in certain areas then others. One big thing with comparing speakers is the room they are in, every room sounds a little different some much more than a little different. Part of the reason why I said try the new room first, I know moving speakers is not fun at all. But it would be ashame if the new room sounds best with Cornwalls over other models and you switched already. It's much cheaper for you to try the Cornwalls in the new house to see if there are certain thing you don't like or would prefer before considering switching. I really like all three models you listed, I Like them all for different reasons, I could live with any of those 3 and be happy. I've decided to stick with my Corns. 1 question though, if I decide to sell a pair, is there going to be any benefit in keeping the 1975's over 1983's. Sound wise they are more similar than not, and I will be changing out caps, and or crossovers, so sound-wise will not come into play. I know that these might seem like silly questions, but I am curious. Well I think that's a good idea, at least for now so you can see what happens. That's a good question about the two different years, I don't know the answer. But I remember some people liking some years over others, hopefully someone will answer. Is one of them a 2 model, I only say this because I think some liked the original over the 2's, but I'm not sure. Good question if your going to let a pair go, keep the preferred model. Good luck and I hope your new room sounds great with whatever you decide to do in the long run. It's always exciting to set up in a new room/house, good luck. Thanks for your help dtel. I believe the 83's are series 1.